I began the Charity Play of the Week promotion in March of 2012 as an extension of my own personal gift-giving philosophy. For over 20 years I've been a consistent contributor to nationally recognized charitable organizations like St. Jude's Children's Research Hospital, the Make-A-Wish Foundation and Special Olympics, among others. But, at the same time, I also found myself sending donations to total strangers whose stories I read about in newspapers across the nation while researching and handicapping games. While giving away money that I personally made from being in this business, it dawned on me that I could create a community of givers from those that gamble using my advice and that of the handicappers at this site. The word "gambling" and the entire sports handicapping industry has been tarnished by the countless, unscrupulous carnival barkers who have been operating high-pressure, 800 boilerroom operations for the better part of three decades. However, having built and operated the largest 100% online sports handicapping business in the world, I always felt there was some greater good that could be accomplished while enjoying what we do for recreation. Back in 2012 while handicapping games I came across the story of a father with two special-needs children in Texas who was battling terminal cancer. There was a fund-raising effort started to collect money for his eventual funeral expenses and his family's well-being. I immediately made my own personal donation but then started thinking about how I could get our customers involved as well. 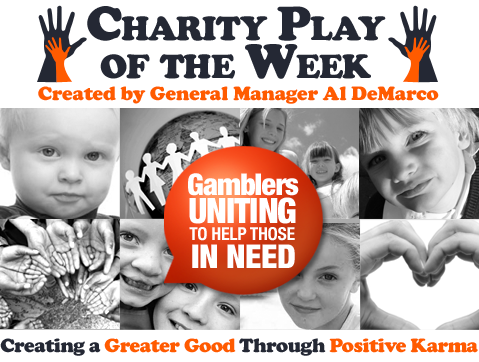 The Charity Play of the Week program was thus born when I gave away my Best Bet the following day for Free with the stipulation that if it won I was going to put up a link to the fund-raising site and ask customers - strictly on an anonymous, honor-based level - to make a contribution. If it lost, however, there would be no solicitation since this is, after all, gambling. The play did in fact win and the outpouring of support from my customers was amazing. The amount of the donation wasn't important as I asked them to make whatever contribution they could afford. And, as I explained to them, I was starting the program because I personally felt one could never have enough positive karma in one's life, not just in this thing we do called gambling. As I have often told you frequently since the program was born, karma is not something that can be picked at the supermarket or dropped off at your door like the morning paper. You need to create it and the good will this program has generated is proof positive. Since the program's inception, I have given away over $3.4 million (yes, MILLION) worth of selections at the site (through late-September 2013). And the response has been overwhelming because so many of you - loyal patrons at this site - have helped so many strangers in need of financial assistance when their chips are down. That is what building a community of givers is all about. Yes, a COMMUNITY, because without your participation this program doesn't exist. For those of you new to the program, once a week I'm going to pick one hot handicapper and give away his play for free. Then if it wins - and if you win - I'm going to ask you to make a donation to a family, group or organization that needed financial support. The amount of the donation is inconsequential; $5, $15 or $500 - it doesn't matter as long as you participate in this quid pro quo program. The donations would be strictly on the honor system; I have no idea who you are or how much you contribute. And I have no idea whether those getting the free plays are in fact making a contribution. I'm simply going on my belief that there is honor among gamblers and that those of you participating are helping others in turn. For those who have joined me in helping others, my sincere thanks. For those of you that participate and don't donate, I don't know how you can face yourself in the mirror each day. I've told you that I become personally invested in every family and/or organization that we've helped. Not just from a financial standpoint, either. It takes me a couple of hours following a winning release to sort through all the different fund raising sites seeking support. It's not fun reading about so much despair and I don't like "playing God," choosing one family or group over another. After I make a selection, I like to keep track of how those on the receiving end are doing. Sometimes it's great news.... and sometimes not. We are often dealing with life and death situations here. Below I will keep you updated on a number of past families and/or groups we have helped along the way. Tytus Meister is a 9-year-old boy from Montana who was diagnosed in September with a rare cancer-like autoimmune disease called Langerhans Cell Histiocytosis. He began radiation treatment in Seattle on February 26. The family was then on its fourth 500-mile trip from Montana to Seattle for a hospital visit in the past five months and second in three weeks. Needless to say, they need some financial help to make ends meet for all the expenses that insurance doesn't cover. Here is a note from Tytus's mother that was posted to their site. Although addressed to me, it's meant for all of YOU that help defray their journey's costs. As we sit waiting on more results from tests, and other forks in the road that we didn't anticipate, you somehow managed to lift our spirits in a huge way. We can't begin to tell you how much we appreciate you and what you've done. We didn't expect it, I was lucky enough to figure out where all these were coming from. This is special, and we won't ever forget! THANK YOU! Tytus is doing absolutely AWESOME. He's spending less and less time in his brace and starts physical therapy soon! We recheck with ortho, and neurosurgery in June!